Ullman DynamicsNewsSuperyacht Tender from Scorpion with Echelon seats! Superyacht Tender from Scorpion with Echelon seats! Earlier this year Scorpion RIBs (UK) launched another Silurian 1080 fully equipped and configured as the ultimate superyacht tender. We are proud to be a part of this tender that features four customized Echelon seats. All the seats have been given a carbon racing look with red upholstery. 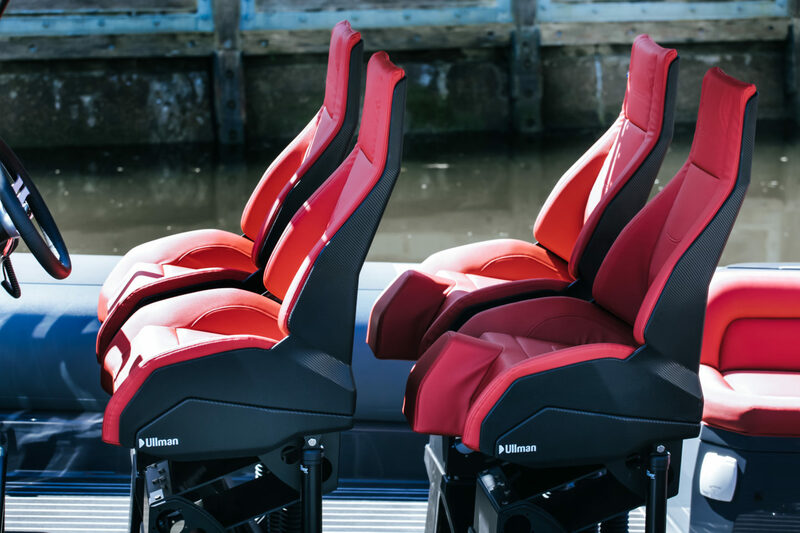 2 x Echelon Mid Back Flat Front seats – The flat front provides a comfortable lean-post position for helm and navigator when maneuvering or docking in confined areas. 2 x Echelon Mid Back Jockey Front seats – The jockey front enables the Echelon seat to act as a hybrid, with the characteristics as a jockey seat but also as a bolster seat. The Echelon seat is developed for high-speed crafts together with demanding users from Special Forces, NAVY, Coast Guard and Sea Rescue.